To find out which size you need, please check the backside of your Daniel Wellington watch. Here you can find the type (Classy, Classic, Dapper or Grace) and a 5 digit code. The first letter of the code is followed by two numbers representing the width of your watch case. If it says '38' you need a 19mm watch strap. If the number is different, please check the other sizes. On this page you can find the 19 millimeter wide watch straps for Daniel Wellington models with a watch case diameter of 38 millimeters. 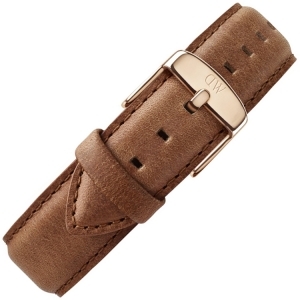 The original 19mm wide watch strap for Daniel Wellington Dapper Durham watches (with a 38mm case diameter), made of brown leather, with an original rosegolden stainless steel buckle by Daniel Wellington. The original 19mm wide watch strap for Daniel Wellington Dapper Durham watches (with a 38mm case diameter), made of brown leather, with an original stainless steel buckle by Daniel Wellington. The original 19mm wide watch strap for Daniel Wellington Dapper Reading watches with a 38mm case diameter. 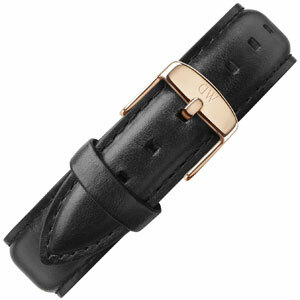 The original 19mm wide watch strap for Daniel Wellington Dapper Sheffield watches with a 38mm case diameter. The original 19mm wide watch strap for Daniel Wellington Dapper York watches (with a 38mm case diameter), made of dark brown leather, with an original rosegolden stainless steel buckle by Daniel Wellington. The original 19mm wide watch strap for Daniel Wellington Dapper York watches (with a 38mm case diameter), made of dark brown leather, with an original stainless steel buckle by Daniel Wellington.